NEW DATE! MARK YOUR CALENDAR! We have rescheduled this event to Saturday, September 8th 2018. Come on out and join us! 9:30am – 11:30am! Our instructor for this workshop is the talented Jo Ellen Reinhardt! This one-day sketching workshop provides an opportunity to quickly capture the beautiful area of River Bend Farm. 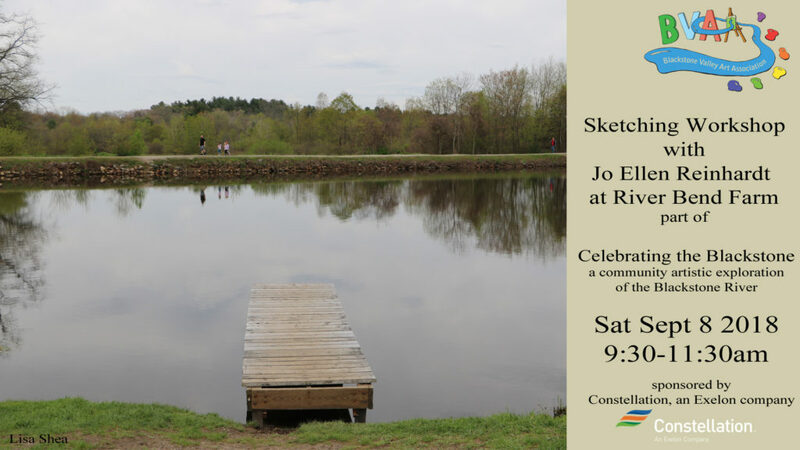 After a complete sketching demonstration, Jo Ellen Reinhardt will guide you along as you capture your beautiful surroundings. All media are welcome. Demonstrations will be with Aquarelle Graphite Pencils and water. River Bend Farm is a beautiful location alongside the Blackstone Canal in Uxbridge. There’s a lovely walking path, several bridges, along with ample turtles and other wildlife. Please let us know via our contact form if you’re planning on coming, so we know to wait for you. If you need help with supplies, let us know. It’ll be a great morning of learning about sketching and exploring our Blackstone River history! I have just signed up to take this class with JoEllen but do not know how much it costs. I do not use PayPal so I can send a check if you can tell me the cost. Also, is there a list of supplies that one needs to take the class and. of so, where is that posted? I did not notice it on the website. This is free – sponsored by the Constellation group as part of our Celebrate Blackstone series. I will be posting the supply list soon :). will attend sketching workshop at river bend farm. Will regular sketching pencils be acceptable? My watercolor pencils are next to useless! I bought some water-soluble graphite pencils on Amazon. They are not expensive (I don’t know if they carry them at Michael’s). They “dissolve” more thoroughly than regular graphite. A friend and I tried both at open studio and the regular graphite pencils left streaks.